Being an early planner, Margaret’s mommy first contacted me while we were on our family vacation in September to create something special for Margaret’s first birthday in December. Sometimes custom orders, where the customer leaves it completely up to you to create something really special for their childs first birthday can be daunting. We discussed colors and ideas, for months, and all of a sudden I knew exactly what I wanted to create! 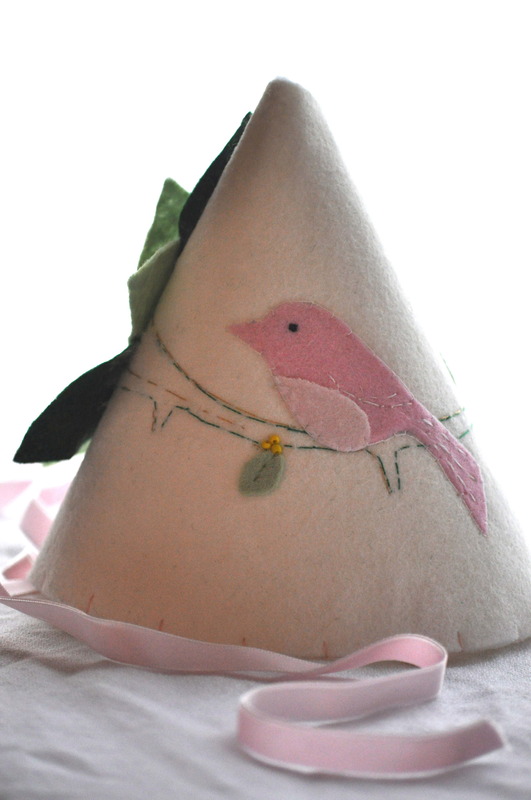 This hat is so darling, I am giddy with excitement to give Margaret’s mommy a sneak peek, and to share it with you! Sorry, I didn’t get any good shots of the bunting…it has alternating pink and white flags, with Margaret’s name in light green and darker green buttons between each flag. The bunting also has two designed end flags where on one end is the darling little pink bird, and a poinsettia on the opposite end. This hat is not currently available in my shop, however, if you would like to contact me here…I would be happy to create something especially for you!